"There's a hit piece about you online," a colleague phoned to tell me last month — heart-stopping words in an industry where few policy analysts know quite as much as they let on about. "It accuses you of supporting jihadists and suicide bombings." "Oh, thank God," I replied. By "alt-left" I mean that these folks have a fundamentally conspiracy-minded view of the world that trumps ideological purism. Some (though not Lazare) are 9/11 truthers. Many believe that Al-Qaeda and ISIS were deliberately conjured in some capacity by the United States to smite its enemies, provide a pretext for military intervention in the Middle East or advance various other nefarious agendas. The alt-left has a fundamentally conspiracy-minded view of the world. Of course, this extreme distrust of the federal government has more than a passing resemblance to that of the alt-right. Much like the editors of Breitbart, Lazare maintains there is a "Deep State" operation underway to unseat Donald Trump on false charges of collusion with Russia. Lazare's new article is the latest in a succession of alt-left exposés, notably by Tony Cartalucci (in a piece reprinted by the alt-right Infowars.com) and Sam Muhho, tying me to an alleged U.S. government conspiracy to aid Syrian Islamists, all on the basis of my August 2012 article in Foreign Policy, "Two Cheers for Syrian Islamists." Exhibit A for Lazare is an August 2012 Defense Intelligence Agency report (made public three years later following a FOIA lawsuit) that described, among other things, the growing salafi-jihadist presence among rebel forces fighting Syria's Assad regime. "Enter Gambill and the FP" a few days later to "argue that such a development was both unavoidable and far from entirely negative," Lazare gleefully proclaims (an ounce of coincidence is worth a pound of manure in conspiracy theories). 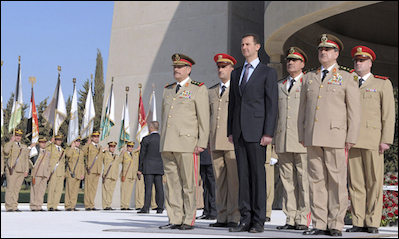 The Assad regime is dominated by Alawites, a heterodox Muslim sect comprising just 12-14 percent of the population. Though his insinuation that I had seen the DIA report is incorrect, that's a fair summation of what I wrote — that "Islamist political ascendancy is inevitable in a majority Sunni Muslim country brutalized for more than four decades by a secular minoritarian dictatorship," particularly with "enormous financial resources ... pouring in from the Arab-Islamic world to promote explicitly Islamist resistance to Assad's Alawite-dominated, Iranian-backed regime." I argued that Islamists, who had no compunction about driving half a dozen suicide-bomb-laden trucks into heavy cement fortifications to breach an enemy position, were playing an important part in turning the tide of the war against a regime with vastly superior weaponry and greater resources. Nowhere in the article did I suggest the United States was, or should be, involved in aiding the jihadists. I merely wrote that we should "quietly root" for their continued success battering Iranian-backed regime forces — and with two cheers (not the full three). Okay, so the title was too clever by half. It's hard to imagine an article called "Tactical and Strategic Implications of Growing Religiosity among Syrian Rebels" causing such a fuss. But it's even harder to imagine a play on words being the decisive factor fueling the imaginations of Lazare and company. According to Lazare and company, the publication of "Two Cheers" was a watershed moment for Syria policy. And yet here we are. According to Lazare, the publication of "Two Cheers" was a watershed moment. "This kind of self-centered moral calculus would not have mattered had Gambill only spoken for himself," he writes. "But he didn't. Rather, he was expressing the viewpoint of Official Washington in general, which is why the ultra-respectable FP ran his piece in the first place." Why Foreign Policy invited me to write on Syria during the early years of the civil war is indeed mystifying, but it certainly wasn't because I spoke for anyone. While acknowledging that I "didn't distort the facts or make stuff up in any obvious way," Lazare claims that my "disastrous thinking" led the Obama administration — that's right — to secretly wage a brutal "sectarian offensive" against Iranian-backed forces in Syria, at the height of its delicate negotiations with Tehran over the fate of its nuclear arsenal, in which some 400,000 are believed to have died. "[I]nstead of advancing U.S. policy goals, Gambill helped do the opposite," Lazare concludes. 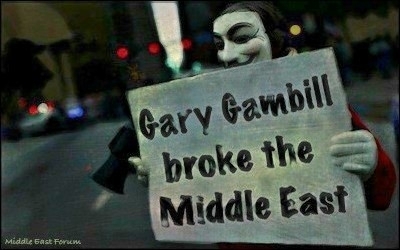 "The Middle East is more explosive than ever while U.S. influence has fallen to sub-basement levels. Iranian influence now extends from the Arabian Sea to the Mediterranean." Fortunately, the alt-left claim that I broke the Middle East seems pretty harmless. While a series of articles accusing me of conspiring against jihadists would have scared the daylights out of me (they've murdered plenty of Westerners accused of far less), I'm pretty confident that Assad regime assassins aren't going to whack me without first verifying that I'm not, you know, just some guy who wrote an article.